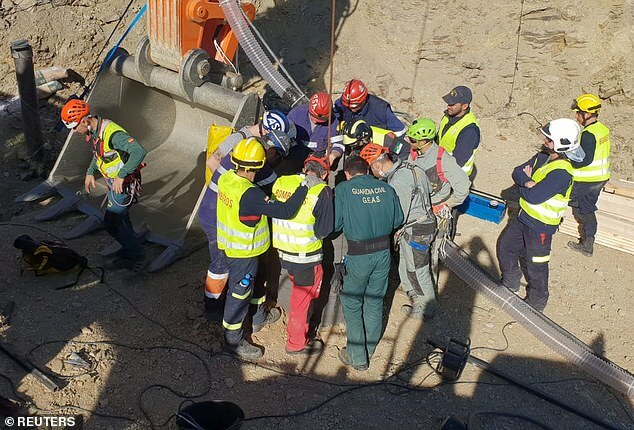 The family of a two-year-old boy trapped underground for 12 days in Spain have prayed for a miracle as miners continue a desperate bid to reach the youngster. 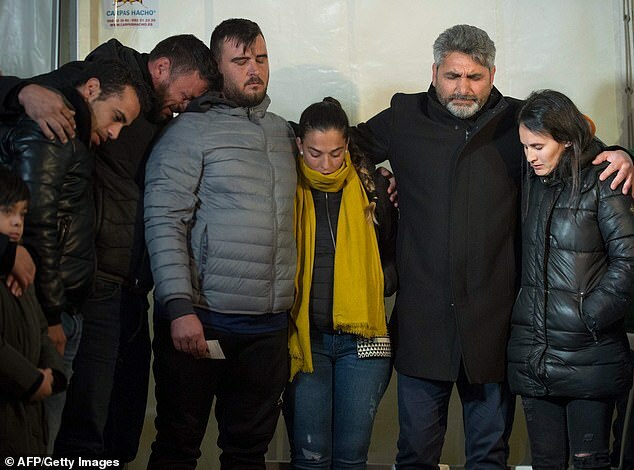 Tearful parents Jose Rosello and Vicky Garcia joined relatives near the scene where their son Julen fell into a narrow well on a private estate in Totalan, southern Spain on January 13. 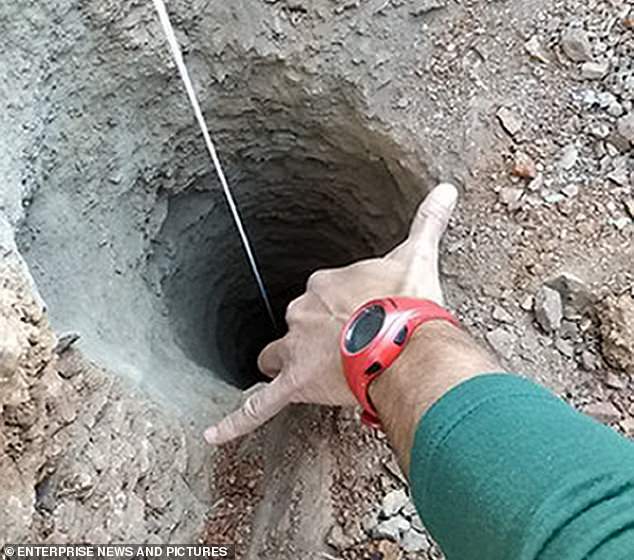 Hundreds of others gathered for a vigil and prayed for 'God to do this miracle' as rescuers completed a 300ft relief shaft beside the original well. 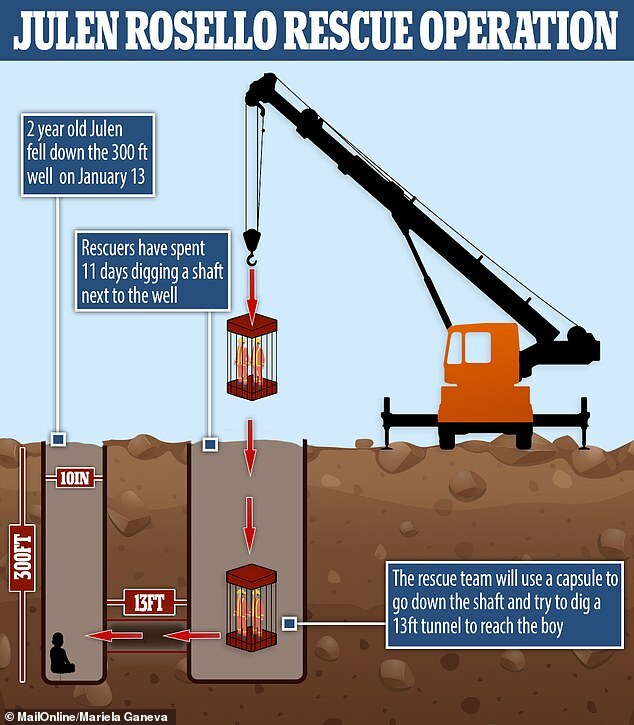 Rescue experts, lowered into the new shaft in a capsule, have already completed the first 3ft of a horizontal tunnel as they look to bridge the 13ft gap to the adjacent well. 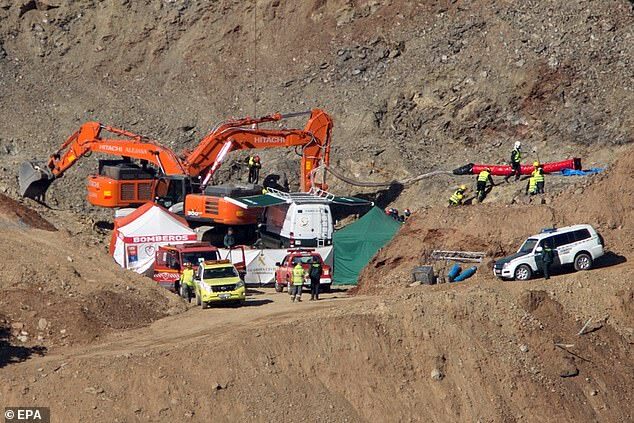 So far, the rescue bid has cost £500,000, but authorities are determined to find the boy and bring him back to the surface in a rescue mission that has gripped Spain. 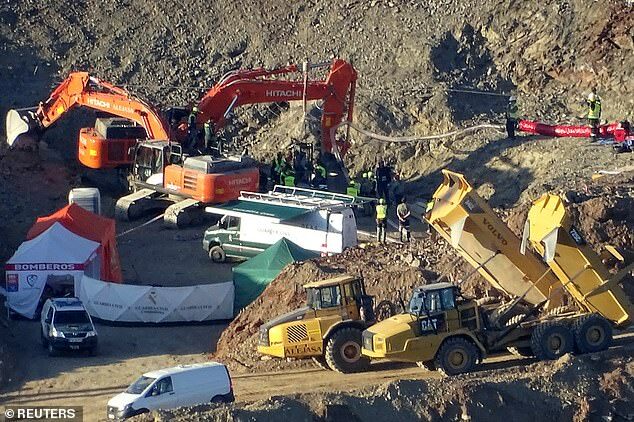 There have been no signs of life since Julen fell into the well, which has since become blocked by earth, raising fears soil has collapsed onto the child. Miners working in rotating shifts will dig a four-metre passage with picks and pneumatic hammers from the bottom of the shaft towards the borehole, which is 300ft deep and just 10ins wide. Teams equipped with oxygen masks will work for 40 minutes each in conditions so tight they can only dig kneeling or lying down. 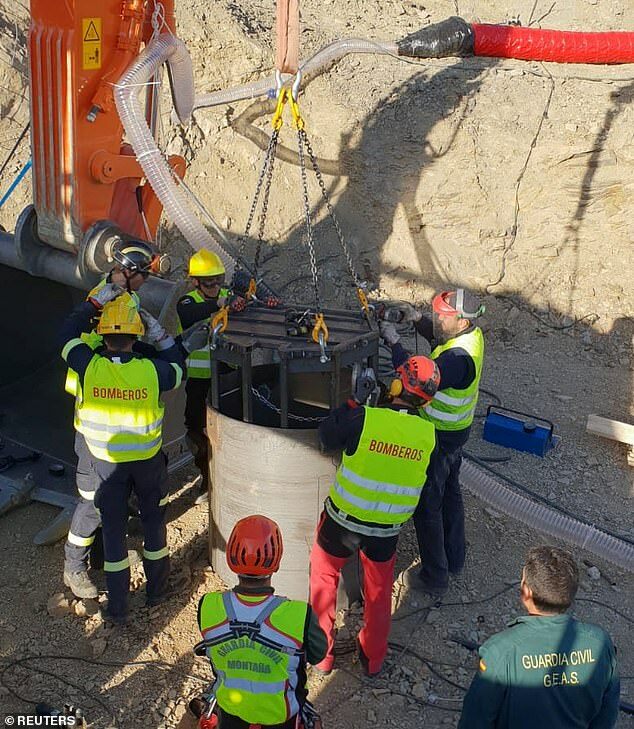 The process of crossing the divide between the two shafts could take up to 24 hours, emergency services chief, Ángel García Vidal, has said. 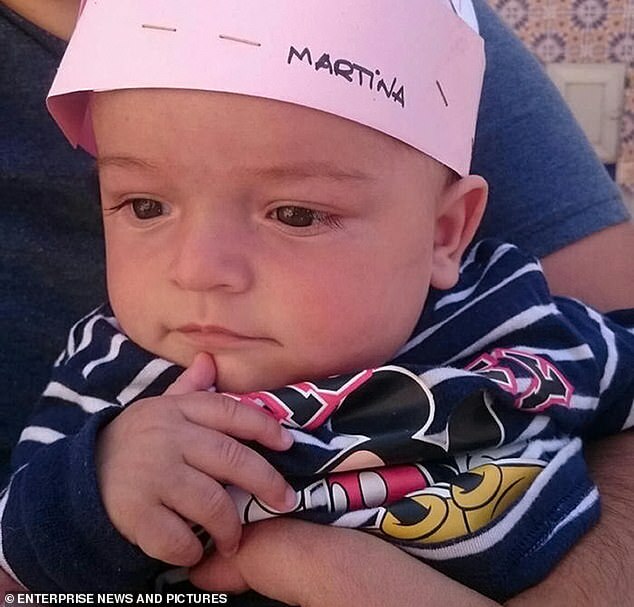 Meanwhile children and families have been holding candlelight vigils across Spain in support of the missing boy and of the massive rescue operation, even as hopes of finding him alive have faded with each passing day. Julen's mother and father, both 29, held each other tightly as they attended a vigil a few minutes from the scene last night. According to Bild, some 300 people also gathered there. Cortés' own five-year-old daughter was found murdered ten years ago after weeks of searching and he has been supporting Julen's family. 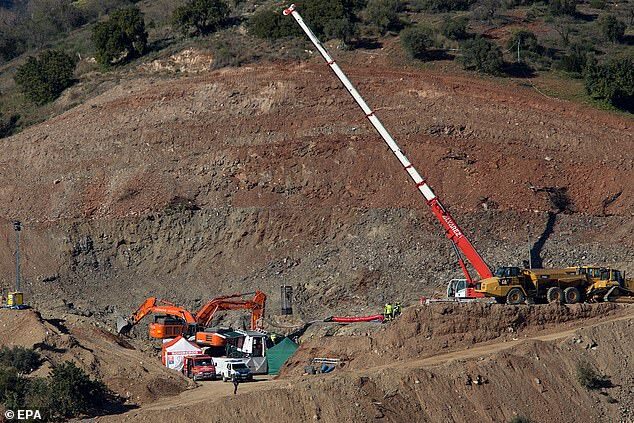 Engineers and miners have worked for ten days in a row but have run into various technical problems while drilling a shaft parallel to the well. He told reporters earlier that digging the horizontal passage would be the most dangerous part of the effort. 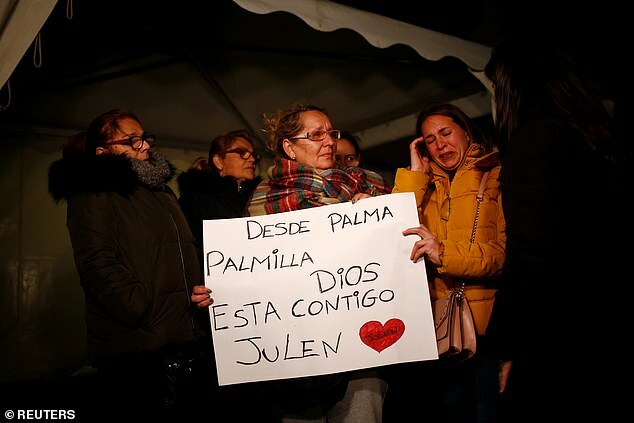 Julen's parents suffered another tragedy in 2017 when their three-year-old son died suddenly after suffering a cardiac arrest while walking along a beach.